The Primrose Piano Quartet is named in honour of William Primrose CBE (1904-82), one of the finest violists of the twentieth century, and his piano quartet, the Festival Quartet. Formed in 2002, it united two long-standing partnerships: Susanne Stanzeleit and John Thwaites met twenty years ago at the Guildhall School of Music and Drama, and are members of the Audley Horn Trio; Robin Ireland and Bernard Gregor-Smith spent twenty years together in the Lindsays. From March 2009 onwards, Bernard's place will be taken over by another long-standing chamber colleague, Andrew Fuller. Together they have made a specialism of British repertoire, with a comprehensive survey of the twentieth century literature, and ongoing relationships with many composers. The group's first CD of works by Thomas Dunhill, William Hurlstone, Roger Quilter and Arnold Bax was released to wide critical acclaim in December 2004, and their second CD of works by Cyril Scott, William Alwyn, Herbert Howells and Frank Bridge, which followed in 2006 was a Five Star choice in the Classic FM Magazine. They celebrated William Hurlstone's Centenary (30th May 2006) live on BBC Radio Three and at the Wigmore Hall the following day. Commissions include a new twenty minute work by Sir Peter Maxwell Davies with premières for the July 2008 Cheltenham Festival (World), Paxton House Festival (Scottish) and Kings Place (London). The Quartet was selected for the Making Music Concert Promoters' Network in 2004/05, and also tour every year in Scotland, recently including the five concert 2007 Argyll and Bute tour. 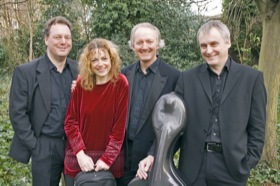 In 2004 the group was appointed Quartet-in-Residence at the London College of Music. In addition to annual concert cycles, they coach chamber music, work with composition students and present masterclasses. Future plans include a recording for the Meridian label of Richard Strauss's Piano Quartet, Violin Sonata and Cello Sonata for release in 2009, a CD of the new Piano Quartet by Sir Peter Maxwell-Davies, a première recording of a Piano Quintet by Dmitri Smirnov and a new commission, as well as a CD of Faure and Brahms Piano Quartet..
One of the leading violinists of her generation, Susanne Stanzeleit has performed worldwide as a soloist and chamber musician. She is well known for her unusually challenging and extensive repertoire, featuring many commissions and UK premières of works by composers such as Peter Maxwell Davies, John Adams, Lou Harrison, György Kurtág, John Woolrich, Philip Cashian and many others. Susanne regularly broadcasts on BBC Radio 3, Classic FM, German Radio and other major TV and radio stations abroad. She has received rave reviews and a Gramophone Award nomination for her long list of commercial recordings, which feature the complete works of Bartók, Enescu and Dvorák as well as Beethoven violin sonatas, works by Charles Camilleri and a series of English sonata recordings. Chamber discs include six discs with the Edinburgh Quartet, chamber music by Kenneth Leighton and two CDs of British piano quartets with the Primrose Quartet, all on Meridian. Susanne was first violin of the Edinburgh String Quartet until 2002 and co-leader of Sinfonia 21, as well as guest-leading many of the foremost chamber orchestras and contemporary music groups in the UK. She was Head of Strings at the London College of Music and Media from 2002-2006 and now teaches at the Birmingham Conservatoire. Robin Ireland is best known as the viola player with the Lindsay String Quartet, with whom he played for twenty years until the group's decision to disband in July 2005. Just three months later he joined the Sorrel Quartet, and looks forward to an equally fruitful partnership with them. Robin is also an experienced soloist and has appeared with the Liverpool Philharmonic and the London Mozart Players. He has broadcast on BBC Radio 3 and has given many recitals, often featuring transcriptions for viola of Bach's unaccompanied works for violin and 'cello. His CD of unaccompanied Bach, including the Chaconne, is available on the Quartz label. Since 1999, composing has become an increasingly important part of Robin's life. He was commissioned by Sheffield University to write a string quartet for its centenary celebrations. This work, played by the Lindsays, features on a CD alongside Pairings - his three duos, for violin and viola, viola and 'cello and two violas, released on the Meridian label in September 2005. Robin is a committed and enthusiastic teacher of viola. He was a part-time lecturer in Manchester University's Music Department for 20 years, and has given talks and seminars in Manchester and Sheffield. He is an experienced chamber music coach and masterclass tutor, and is skilled at leading groups experimenting with improvisation. As a writer, he has contributed to the BBC Music Magazine. Andrew Fuller has a busy and varied career as a soloist, chamber musician, guest principal, session musician and teacher. His duo partnership with Pianist Michael Dussek has had great success with recent concerts and recordings, their CDs of Cello works on the Dutton Vocalion label receiving critical acclaim, several being selected as Editor's Choice in Gramophone Magazine. He was Associate Principal with the Royal Philharmonic Orchestra for seven years, leaving in 1997 to concentrate on solo and chamber music. Since then he has regularly worked as guest principal for the RPO as well as many others including the Philharmonia, BBC Concert Orchestra, the City of London Sinfonia, the Hallé Orchestra and the Orchestra of St Johns. As chamber musician he has made many appearances at The Wigmore Hall and at festivals and music clubs around the world, and has made many live broadcasts and recordings. He was a member of the York Piano Trio, the Fibonacci sequence, Aquarius, and Primavera. A member of the ground breaking new ensemble "Chamber Music Direct" he has also been a regular guest player with other Groups including the Sorrel, Brindisi and Coull String Quartets, Endymion and the Schubert Ensemble. He was a visiting lecturer at the Birmingham Conservatoire from 1997 to 2003 and regularly coaches at the Royal Academy of Music and for UK youth orchestras. John Thwaites studied with Harvey Dagul, Sulamita Aronovsky, Renna Kellaway, Paul Berkowitz, Martino Tirimo and Christian Blackshaw, on the Joint Course in Manchester, at the Guildhall, and in Siena, Vienna and the U.S. He grew up in the same street as 'cellist Alexander Baillie, with whom he has been playing for a quarter of a century. They were invited by Ralph Kirshbaum to play in the Gala closing recital of the inaugural Manchester International 'Cello Festival in 1988 and to give the opening recital in the final 2007 Festival. They have recorded and broadcast together, and play annually at the Cotes des Isles Festival in France. Another long-standing and happy association is with Sue Lowe's 'Cello Schools, and this includes regular appearances with Johannes Goritzki. John was a member of the Music Group of Manchester 1986-93, and is currently a member of the Audley Horn Trio and the Scottish-based Da Vinci Piano Trio. His recording of Lyapunov's Piano Sextet with the Dante Quartet was BBC Music Magazine's chamber music choice for November 2004, and he broadcasts regularly for radio. Formerly Head of Piano at Christ's Hospital and a tutor at GSMD, John is now a professor at the Royal Scottish Academy of Music and Drama and Course Director of Cadenza International Summer Music School, a strings and piano course for all ages that meets at the Purcell School every July.